LED BY giants Philip Morris and RJR Nabisco, the US tobacco industry has sued the environmental protection agency (EPA), claiming its report on passive smoking -- the inhalation of exhaled cigarette smoke -- was unscientific and arbitrary. The EPA report, published in January, classified exhaled tobacco smoke in the most-serious category of cancer-causing materials and indicated that about 3,000 non-smokers in the US die each year of lung cancer caused by exposure to tobacco fumes. 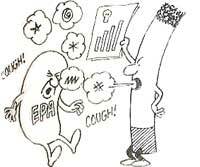 The tobacco firms say EPA ignored critical statistical studies to reach "preconceived and predetermined conclusions".